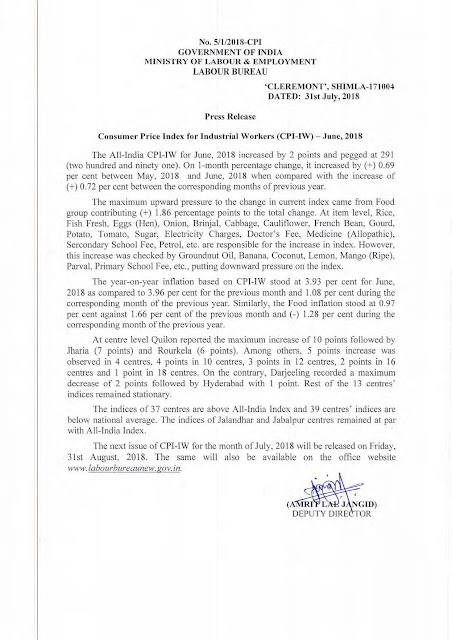 The All-India CPI-1W for June, 2018 increased by 2 points and pegged at 291 (two hundred and ninety one). On 1-month percentage change, it increased by (+) 0.69 per cent between May, 2018 and June, 2018 when compared with the increase of (+) 0.72 per cent between the corresponding months of previous year. The next issue of CPI-1W for the month of July, 2018 will be released on Friday, 31st August, 2018. The same will also be available on the office website www.labourbureaunew.gov.in.